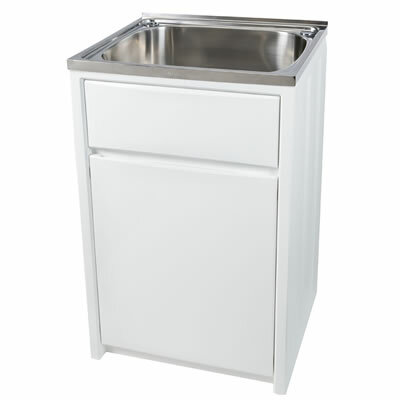 The Project 45SP Laundry Unit is a compact laundry sink that can handle all your laundry needs. 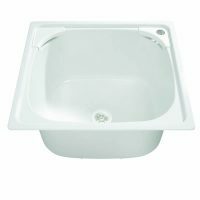 It is equipped with a 45L stainless steel bowl and a large-sized cabinet in a white polymer finish, and it comes as an all-in-one unit. The Project 45SP Laundry Unit measures 560x515x870mm in dimensions. This compact laundry unit boasts functionality. 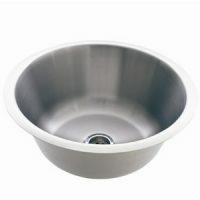 The 45L stainless steel bowl includes a 50mm chrome plug and waste; a chrome plated blanking plug with nut and 2x42mm tap holes with a single bypass. The polymer cabinet can be configured to work either as a left or right-handed operation and it comes pre-marked with 48mm washing machine hose holes. Experience superior quality with this compact laundry. As a mark of quality, the cabinet and the stainless-steel bowl are backed by a 25-year warranty, while a 1-year warranty backs the plugs, waste, hinges and rods. For a compact but highly functional laundry unit in Perth, you’ll find nothing better than the Project 45SP Laundry Unit at Ross’s Discount Home Centre. Shop from our online store today to buy this laundry unit at the lowest price in Perth!